Unfortunately, the excellent American cable channel, Golf Channel, is not available from either of the TV cable companies in Ireland, so I do not follow their popular ‘Big Break’ programme. However, I am aware that there has been controversy over what appeared to be a generous ruling that was afforded to one player, Carl, during a head-to-head challenge with his room-mate, Robbie, which could have contributed to Robbie losing and thus being eliminated from the knock-out competition. I don’t want to dwell too much on the circumstances of the Big Break incident, but it would appear that Carl played a shot from a bunker and it embedded in the lip of the same bunker. The ball was embedded in the ground (roots) just above the level of the sand. The ball therefore was embedded ‘through the green’ and not in the bunker. Through the green, a ball that is embedded in its own pitch-mark in the ground may be lifted, without penalty, cleaned and dropped as near as possible to where it lay but not nearer the hole. The ball when dropped must first strike a part of the course through the green. Grass-covered ground bordering or within a bunker, including a stacked turf face (whether grass-covered or earthen), is not part of the bunker. A wall or lip of the bunker not covered with grass is part of the bunker. A ball embedded in its own pitch-mark in the ground in any closely mown area through the green may be lifted, cleaned and dropped, without penalty, as near as possible to the spot where it lay but not nearer the hole. The ball when dropped must first strike a part of the course through the green. "Closely mown area" means any area of the course, including paths through the rough, cut to fairway height or less. Note that the ball has to be dropped “as near as possible to the spot where it lay but not nearer the hole”. In the circumstances being discussed here this may mean dropping the ball on the steep face of a bunker, from where it is likely to roll back into the bunker. In this case, under Rule 20-2c the ball must be re-dropped. If the same result occurs a second time the ball must be placed as near as possible to where it touched the course on the second drop (which, as above, must be close to where it was embedded), not nearer the hole. If your ball is embedded don’t make the mistake of repairing the pitch mark before you drop your ball. This is a breach of Rule 13-2 for improving the area in which your ball is to be dropped by eliminating an irregularity of surface (Decision 13-2/10). However, if your ball rolls into the same pitch mark, or embeds again on dropping, you may re-drop the ball. If it happens again, you may place the ball where it first touched the course after being re-dropped. I hope that like me, you are gearing up for a wonderful Open Championship. If you look at this picture of the ball, surely there were no course conditions covered in the Local Rule that granted a free drop. Thanks for the photo link, which certainly helps to explain the Big Break ruling. In 2007, many Rules experts were predicting that Rule 25-2 was going to be changed to permit relief for embedded ball 'through the green' in the January 2008 revisions. I live in Ireland and I remember that Clubs here received a letter from the Golfing Union of Ireland (GUI) suggesting that a Local Rule could be introduced straight away, permitting this relief prior to the anticipated change. I presume that the Ruling Bodies had a change of heart as the change did not happen. However, I have been told that in many tour events this Local Rule operates, notwithstanding course conditions. It seems that Golf Channel adopted the same policy for their event. Barry - I still don't understand the ruling or the explanation with the local rule. The local rule says "a wall or lip of the bunker not covered with grass is part of the bunker". Isn't that exactly this situation - the ball is embedded in the wall/lip of the bunker and therefore part of the bunker and NOT through the green? The referee on hand ruled that Karl's ball was embedded in the ground (roots) just above the level of the sand.. Having now seen the photo I probably would have ruled the same way. However, you are not the only one that does not agree with this ruling. I would say that the opinions that I have heard are about equally divided. What I do not approve of is the Local Rule affording relief for an embedded ball through the green when the course conditions are good. I suspect that we may see a change to the Rules in this area come December. It nearly happened in the 2008 revisions, but it seems that either the R&A or USGA changed their mind at the last minute. Doesn't Decision 13/4 make this quite clear? Q: A player's ball is completely embedded in the vertical lip of a bunker. The lip is not grass-covered, so it is part of the bunker. Is the ball considered to be lying through the green? 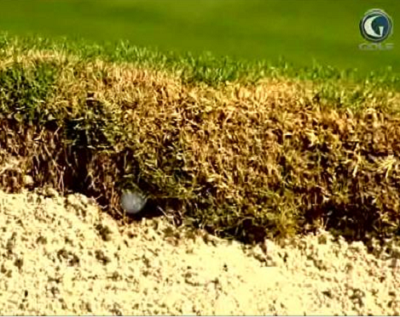 If so, the player would be entitled to drop the ball behind the bunker if he deems it unplayable. A: No. An embedded ball is considered to be lying in the part of the course where it entered the ground. I think the point is that the lip (ie the vertical bit) is not itself covered in grass (where the ball entered) - you can see the soil and roots. The grass above is immeterial - to be Through The Green the vertical lip would also have to be covered in grass. But in the photo the lip is grass covered, which is not part of the bunker and Decision 13/4 does not necessarily apply. It is a subjective call as to whether the ball entered the sand (bunker) and was therefore embedded in the bunker, or whether it entered at the roots of the grass and was therefore embedded through the green. Are Golf and the Rules Fair?